NUSSU Exco expresses its condemnation of any form of sexual harassment, which is a serious community problem that everyone has a responsibility in handling. NUSSU Exco is regretful that Ms Monica Baey, and other victims of sexual harassment, have had to go through such traumatic experiences as an NUS student. NUSSU Exco strongly encourages any victim of sexual harassment to report to NUS, and is willing to assist students in helping report such matters to NUS. Students who know of such victims are encouraged to provide social support and help them seek professional support if necessary. Students who are told to not report such matters, or are not comfortable with approaching NUS directly, should alert and contact NUSSU Exco at feedback@nussu.org.sg. NUSSU Exco is currently in the process of clarifying who had told Ms Baey that she should not report the matter. However, justice needs to consider both the victim and the perpetrator, and needs to be proportionate. While the discussion on the issue of sexual harassment and this particular case is important and welcome, NUSSU Exco also strongly urges fellow students to not harass Mr Nicholas Lim and his family. NUSSU Exco also recognises, that as opposed to a criminal court, that rehabilitation is an extremely strong principle in how student offenders are treated in the Board of Discipline, given that NUS is an educational institution. NUSSU Exco also notes that the Board of Discipline had acted in accordance with existing precedent and due process, and respects that the decision by the Board was arrived at in good faith. However, NUSSU Exco is in the process of considering whether for future cases, as a matter of general policy against sexual harassment, there should be heavier punishments as a matter of deterrence, and for retributive justice for victims. Improving the culture of reporting sexual harassment in NUS, to create a safer environment for reporting harassment. NUSSU Exco also stresses that all members of NUS have a role to play in creating a culture where sexual harassment is not acceptable. This is not the sole responsibility of the administration, and NUSSU Exco encourages students to play their part in ensuring that we create an empowering, safe and trusting environment for all. Education of campus security investigation officers and board of discipline members on how to sensitively handle sexual harassment cases. NUSSU Exco takes issues of sexual harassment seriously, and notes that there is currently a proposal being mooted in NUSSU Council with respect to conducting a survey regarding sexual harassment in NUS. In light of this incident, NUSSU Exco is currently conceiving an action plan to better address issues of sexual harassment. This includes the drafting of a report by NUSSU Exco on whether existing sentencing guidelines should be revised, whilst considering other processes. NUSSU Exco will continue to work closely with NUS in making the campus a safe and secure environment for all our students. NUSSU Exco also notes that NUS President is to convene a Committee to review disciplinary and support frameworks in NUS. NUSSU Exco is confident that the Committee and the administration will continuously engage with students, to create a safer environment that everyone has confidence in. Students who have any feedback on this matter can contact NUSSU Exco via email at feedback@nussu.org.sg. NUSSU Exco welcomes and encourages students to continue to make their views known through official channels, such that the NUS administration and NUSSU Exco can act accordingly. There are at least two online petitions regarding this case, We want Singapore police to reopen Monica Baey’s case! and Stiffer Punishment For Nicholas Lim Jun Kai. There comes a time for everyone when you question the point of it all. Why are you doing this? Is this what life is about? 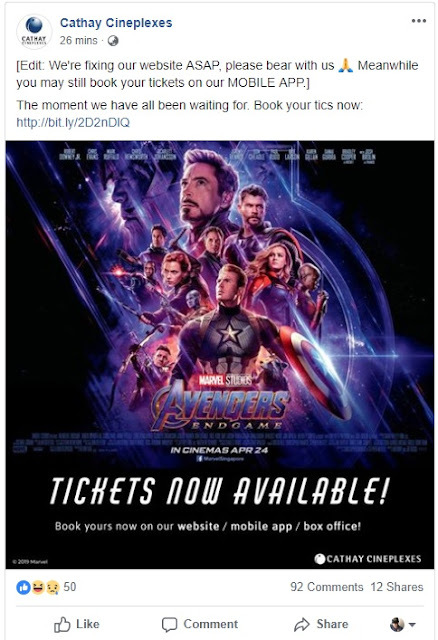 For me, that happened last Wednesday morning as I stared at the queue number on my computer screen, waiting to buy tickets for Avengers: Endgame on the Shaw Theatres website. I wanted Imax 3D tickets, which you can get only at Shaw, but like the Avengers in Infinity War, it looked like I was going to fail. Deciding that it’s better to have non-Imax 3D tickets than no tickets at all, I tried the other cinema chains. But I couldn’t get into the Cathay Cineplexes website because Thanos had apparently snapped its servers to oblivion too. After a few attempts, I was relieved to be able to get good seats on the Golden Village website – until I tried to pay. My credit card payment couldn’t be processed. GV raised my hopes only to turn them to dust like the Mad Titan. At least on the Cathay website, the death was instant. This was crueler. It’s too much for one man. On the other hand, what’s the good of losing heart now, that’s what I say. As a last resort, I tried the website of We Cinemas, (a misnomer since it has just one cinema in Clementi albeit with multiple halls) and managed to book two opening-day tickets. The seats are terrible though – three rows from the front and to the side. My neck is going to hurt after the three-hour movie. At least whatever happens, I will be watching Avengers: Endgame on opening day, just maybe not in Imax 3D. People ask, why must you watch the movie on the first day? Some fans say it’s to avoid spoilers because if you see the movie before other people do, other people can’t spoil it for you and as we all know, hell is other people. But honestly, it’s because I just can’t wait. Like the hardy souls in the queue for A&W at Jewel Changi Airport, I would rather wait in line for hours than wait for the hype to inevitably fade when there will be no more queues. Remember the long lines for Wendy’s in 2009 when it too returned to Singapore after a long absence like A&W? Well, the queues for Wendy’s are gone – and so is Wendy’s. And it wasn’t even Thanos’ fault. And even though I already got my We Cinemas tickets, ultimately, the endgame was still Imax 3D. I could just sell my extra tickets on Carousell and maybe even make a profit. Like the Avengers, I wasn’t giving up – yet. But as I sat there counting down the minutes in the online queue for the Shaw website, I felt like I was watching my life tick away as well. I wondered if it was really worth it. Why was I doing this? Was this what life is about? In an instant, all will vanish and we'll be alone once more in the midst of nothingness. More than one minute later, it said the same thing. In the time it took for me to get the tickets, I could’ve watched the whole goddamned movie. Minutes later, I was re-directed to the Avengers: Endgame ticketing page. My patience had been rewarded! I rejoiced. I couldn’t click on anything. At least the Cathay website didn’t string you along for “more than an hour” before hanging. It disappointed you right away. Shaw made sure you suffered first. Astronomers were taking pictures of me because I was in a black hole where time had no meaning. Like the search party for the runaway bull in Lim Chu Kang, I finally gave up. And thus ended one of the most existentially stressful mornings of my life and I’ve flown on Scoot before. I later bought 3D tickets from GV and this time, the payment went through. No Imax but close enough. 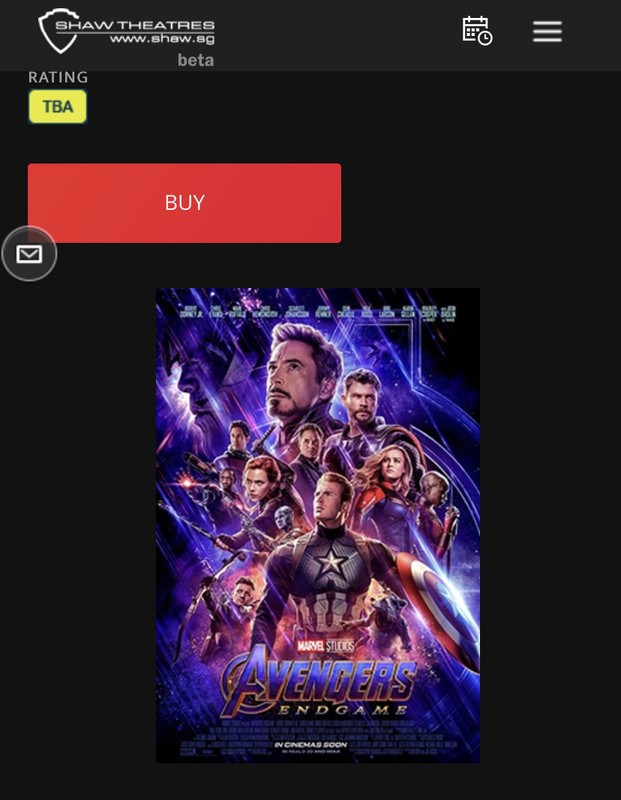 Anybody want two tickets to watch Avengers: Endgame at 11.05am on April 24 in Clementi? Is $500 too much to ask? Last week, Gojek announced that it is improving the welfare of its Singapore drivers by introducing a benefits programme called GoalBetter, which includes fuel rebates and prolonged medical leave insurance. Just in time too because one Gojek driver who seems to really need improved welfare is Mr Aaron Heng, the social media villain of the week. Remember the Gojek “kidnapping” video two months ago? This is like the sequel but with new characters. So maybe it should be called a “reboot” instead? Anyway, the premise and format is the same. The driver fears the passenger is accusing him of cheating. So to protect himself, he records a vertical video of his interaction with the passenger and it goes viral. This could be a new TV reality anthology series called Singapore Gojek Story or The Gojek Zone. Jordan Peele could host it. The second episode can be called “I’m not a millionaire like you”. The stars of this episode are Mr Heng and an elderly couple he picked up. Once again, the video starts in medias res, meaning in the middle of the story, so you’re not shown what led up to the events in the video. It appears that when the passenger made the booking, he thought the fare was $14.10, but after getting into Mr Heng’s car, he learnt it was $21.10 on Mr Heng’s app. So Mr Heng pulled his car over as the passenger called Gojek for clarification. Meanwhile, Mr Heng was unhappy that he was accused of overcharging and kept interjecting while the passenger was on the phone. The passenger eventually agreed to pay the $21 and said he would sort it out with Gojek later. Mr Heng was not happy about that either. “Then that is something you got to sort out with Gojek,” said the passenger. The 6-minute plus video ends after the couple manage to convince Mr Heng to continue driving. Like the Gojek “kidnap” video, Mr Heng’s video went viral. 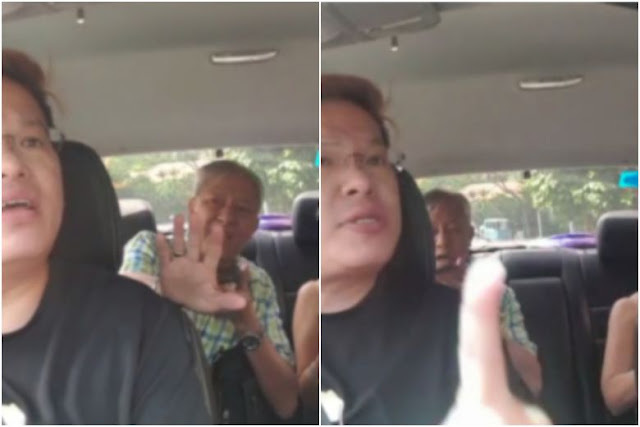 Unlike the earlier video, which garnered much support for the driver, Mr Heng’s video did the opposite. It wouldn’t be a surprise if someone threatened to egg him. Hi. I am the driver in this video. I'm drive as a Private Hire Driver to earn a honest living to provide for my family. I've tried my hands in seeking other employment opportunity but to no avail. I want to say I've got nothing against the elderly especially the poor and the aged. In fact, I just posted a post on how an elderly offered to buy a meal for a wheelchair person and I even went up offering to pay for his meal. They were like us and one day we will be like them. That's why I believe in helping them out if I can. Story is like this. I picked this couple from a country club to his destination. Normally I would confirm with the rider on his destination and the amount to pay and to our surprise, we found out that there was a price discrepancy. I then told the rider that it showed $21.10 on my app while he said that he has to pay $14.10 although he refused to show me his app saying $14.10 (I asked couple of times). He suddenly got irritated and asked me to alight him immediately. For his own safety, I told him it's dangerous to abruptly stop in the middle of the road like that but he went on insisting to alight him. I obliged. I managed to find a small road to enter to stop by the side wanting to alight him and to call GoJek to ask for instructions. I openly notified the couple that I am doing a recording just in case I am accused of overcharging the couple. I cannot afford to lose this job. I've mouths to feed. Why I behave in such a manner is because I was accused of overcharging the passenger. I did not. It is the system. And what I said in the video was to say that I am just trying to hit my incentives as the fares are already low. The pressure is immense. The terms are challenging. I'm facing a lot of stress to meet the targets. Lastly, I want to apologise for my behaviour as shown in the video as time is precious to us as a private hirer driver. I was unnecessarily rude. I was not respectful. I did not explain myself clearly. I pray for a chance to make good. But his apology was about as well received as a rat in a Teochew restaurant. Mr Heng’s Facebook page is no longer available. On Saturday, Mr Heng also made a police report. In it, he said that he sent the video to a WhatsApp group “asking for advice” and named the people in the chat group. Gojek has since said that the company looked into the case and had resolved the matter between the driver and his passengers. By the way, under the company’s new GoalBetter programme, drivers who use their DBS or POSB debit cards to pay for fuel will also get a $7.50 weekly rebate if they spend at least $180 a week. That’s how you can get your $7 back right there.